My work focuses on adventure games, from interactive fiction to different types of point-and-click adventure games. These projects explore the different levels of storytelling: on the one hand, there’s the story of the player, how to provide cues about what to do, and how to let players construct their own stories. On the other hand, there’s the story of the fictional world, and how to communicate that through objects and environmental design. The Myth Machine is a “tech-gothic” immersive mystery set in a near-future world of crumbling start-ups. Inspired by speculative sci-fi like Black Mirror, The Myth Machine confronts the dark side of modern technology and tech start-up culture as a first-person scavenging game. This game is currently in development. This mobile game is prequel to the movie Transcendence (2014). The player becomes a lab assistant who becomes involved in a series of computer experiments involving human memories and computers, experiments which raise some serious ethical questions and require the player to take sides. I was co-designer of the game along with Matthew Weise, and developed in collaboration with The Alchemists Transmedia Storytelling Co. This example of transmedia storytelling allows the player to explore some of the themes and meet some of the characters in the film. The core mechanics involve examining and matching images, allowing players to come up with their own interpretations of each segment of the story. The player becomes a museum curator, who has to organize an exhibit to honour the life of the composer R. Carmine. Who the composer is, and how somebody’s possessions tell their life story, are the key questions of the game. 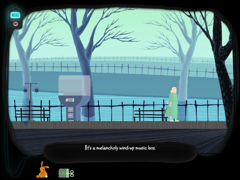 The player collects items from a house, which then she has to select and send to the exhibit. Which objects the player chooses determine the story that the exhibit tells. The conceit of the game is that everything is hidden in plain sight. Not only the objects the player has to find in each room, but also the stories of the characters, and the melodies associated with them. 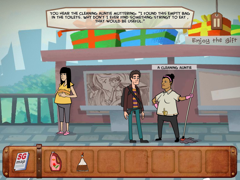 The player is a traveler stranded in Singapore, forced by circumstances to complete tasks for the eccentric Auntie MeeMaggi. The puzzles in the game are procedurally generated; each playthrough should then provide a different experience, bringing more replayability to adventure games which are usually scripted out very intricately. The game takes place in the dreams of a paralyzed patient, Symon, who rehearses his hopes and regrets in his dreams. The objects and characters that the player comes across are all part of Symon’s past, which the player has to put together in order to help him find peace. 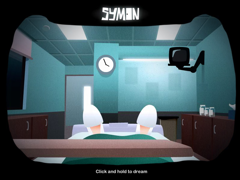 Symon is an experimental adventure game. The puzzles try to reproduce the odd logic of dreams, where things make sense, but not quite. This logic becomes the underlying system of the game, which generates new puzzles procedurally whenever you start dreaming. The theme of the game (being in a dream) is therefore embodied in the design of the game, which at the same time aims at introducing replayability in the adventure game genre. Rosemary is a point-and-click adventure game with a twist: the player has to explore and arrange the memories of the character in order to solve the mystery of the game. When Rosemary discovers a photograph of a forgotten friend, she is driven back to her old haunts to piece back together her memories and unravel what happened to him. She finds herself questioning her memories of the people and places she interacted with in her childhood. I explicitly wanted to avoid the trite mechanic of having the player character be an amnesiac, to level the knowledge of the world of both the player and the character, which has been used repeatedly in games. The key here was figuring out the mechanics of memory, a model which provided engaging game mechanics. The player had to help the character remember things she already knew–as she remembered, the player would learn about her past life. 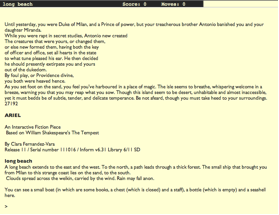 This was a project for my PhD, an interactive fiction piece that drawing from my background in Shakespeare. This piece recreated the island in The Tempest through text. The player is a young Prospero, freshly arrived to the island with his infant daughter Miranda. Their arrival is referred to in the play; this piece incorporates those descriptions and tells the story of how they first settled on the island. I love your games so much! Symon is my favourite – is it strange that dream logic made more sense to me than that of most point and clicks..?